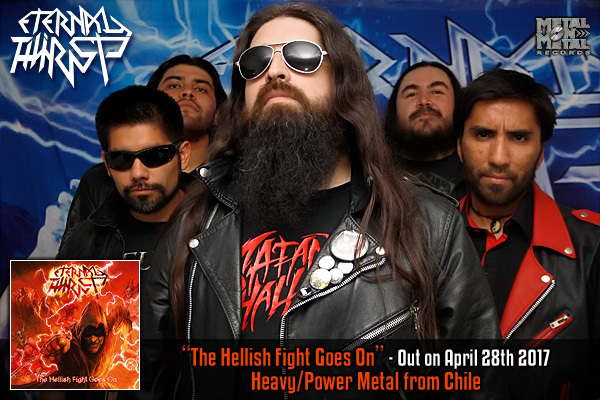 "THE HELLISH FIGHT GOES ON"
ETERNAL THIRST hail from Chile and play heavy/power metal the way it's supposed to be played. The first thing that may draw your attention are the vocals... Quirky, unique and full of expression, Rodrigo's voice sounds might not be for everybody, but the passion is palpable in his voice. That wouldn't mean much though if it wasn't supported by equally convincing and powerful instrumentation. The musicians shared the songwriting duties and it shows in the big versatility of the album - they take their inspiration from both US power and old German heavy/speed metal, and you can hear similarities to SKELATOR, SKULLVIEW, SOLITARY SABRED, ZED YAGO, SACRED STEEL, OMEN, HELSTAR, GRIFFIN, BATTLERAGE, TYRANT (Ger.) or ATTACK. There are lots of breaks and rhythm changes, calm and epic moments are followed by savage fury. If you crave real old school heavy metal, this album should quench your thirst! ETERNAL THIRST began to create their own and original sound in the middle of 2006 in Santiago de Chile. The band was founded by Hugo Álvarez (bass, METAL GENOCIDE), Marco Sandoval (drums) and Javier Alarcón (lead and rhythm guitars), and it didn't take long for them to write their first songs. After one year, Hugo Sánchez (lead and rhythm guitars) and Iván Peña (vocals) joined the band and completed the line-up to record "Rehearsal 2007". 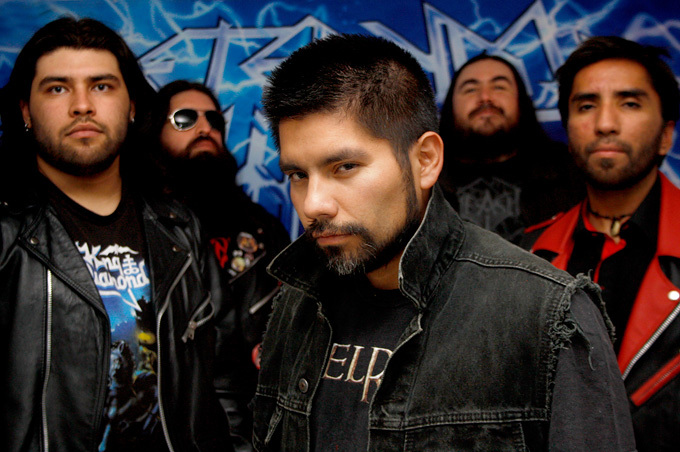 In August 2008, ETERNAL THIRST recorded "Metal's Domain" EP (released in 2009), and after two months, Marco Sandoval left the band due to personal problems. In February 2009, Javier Bustos (lead and rhythm guitars) joined the group, and Hugo Sánchez switched from guitars to drums until the end of 2013. December 2013 saw the release of "Illuminati Army", a new single, which was put out by Defrente Records. Around that time, Javier Bustos left the band and gave back to Hugo Sánchez his old place as a guitarist, while Jonathan Marín joined the band on the drums. 2014 brought more changes in the line-up: in March, Francisco Vera (ex-BATTLERAGE, ex-STEELRAGE, ex-PROCESSION, METAL GENOCIDE, SINS OF THE DAMNED and others) replaced Jonathan Marín on the drums, and Iván Peña decided to leave ETERNAL THIRST. Pablo Garriga took Iván's place behind the microphone and re-recorded the vocals for the band's first full-length album "Beyond the Shadows of Hell", released by Defrente Records on CD and Evil Steel Records on cassette. After approximately one year, Pablo Garriga suddenly passed away. In April 2015, Renzo Palomino joined ETERNAL THIRST to record the vocals for the next album "Metalheads to the Grave", which was released independently on November 28th, 2015. One month before, in September 2015, a single "Lethal Hammer", which featured two songs with Pablo and two songs with Renzo singing, was released by Evil Steel Records. In 2016, Rodrigo Contreras replaced Renzo Palomino on vocals and continued working with the rest of the band on the third album, "The Hellish Fight Goes On". In January 2017, when the album was nearly complete, the band contacted Metal on Metal Records, who upon hearing just one new song with Rodrigo's unique and somewhat quirky vocals and the remaining ones in their instrumental versions, immediately showed interest in releasing the album, and the contract was soon signed. "The Hellish Fight Goes On" saw the light of day on April 28th, 2017, at the Keep It True festival. It brings a lethal dose of true metal, inspired by the '80s US power and German heavy/speed metal scene, played with passion and conviction that this music should always be played with.